With my dairy and wheat allergies I often miss out on some of the best holiday dishes-especially dessert. This year I decided I wasn't going to settle for cranberry sauce and fruit as my dessert yet again for Thanksgiving. I created a gluten free, dairy free chocolate bourbon pecan pie recipe that tastes like I'm not missing out on a thing. It's so good I might not even share. 1 Wholly Wholesome Gluten Free / Dairy Free Pie Shell - 9"
Preheat oven to 325 degrees F. Take GF pie out of freezer and cover outer crust with aluminum foil. Poke bottom of pie shell and sides with fork. Combine sugar, corn syrup, and vegan butter in sauce pan on medium heat until butter melts. Take off the burner and allow to cool to just warm or room temperature. Meanwhile, whisk together vanilla, salt, eggs, and bourbon. With your slightly cooled sugar syrup, slowly pour into your egg mixture-constantly whisking so it doesn't cook the eggs. Mix well. Mix in the chocolate and 1/2 cup of chopped pecans. Pour into pie shell, leaving a tiny bit of room at the top. Arrange whole pecans on the surface in whatever design brings you joy (I went classic). With outer crust still covered in aluminum, bake pie for 45 minutes before taking the foil off. Cook for another 10 minutes, or until set and golden on top. Cool and cover in plastic wrap. This pie is best made the day before so it has time to set after cooling (plus it makes the holidays that much less stressful if you have one less thing you have to make the day of). Chill coconut cream 24hrs in advance, or at least 6hrs. When it cools the fatty, creamy part will rise to the top. Separate the creamy, hardened top part and add the vanilla, agave, and bourbon in a electric mixer OR food processor or blender if you don't have a mixer. In electric mixer: beat until stiff peaks start to form. In blender or food processor: fill a large plastic bag with ice and surround the processor while blending the cream mixture until it becomes thick and stable. Tips: Best if served right away. If not, immediately store in the refrigerator and keep in mind you may need to shortly re-whip it by hand before serving. Do you have any allergies or family members you have to get creative in the kitchen to accommodate? This not only looks yummy, the ingredients are all perfect for a GF diet. Nice holiday dish. Thanks! I think I may try it again at Christmas. 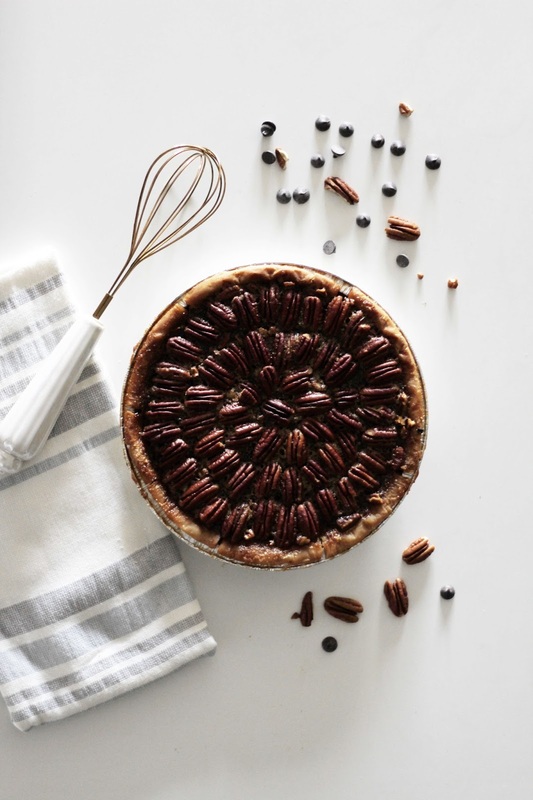 I want to experiment without the chocolate and bourbon and just a classic pecan pie (just GF/DF instead). Combining pecans and chocolate is great. Question we don't drink. I know alcohol burns off. Can you still taste the bourbon? It does have a bourbon flavor, but not like a shot! Just a flavor that melds with the rest. The bourbon adds a little more balance flavor wise with all the sugar. I think it should burn off but if you don't drink just do it without! I would leave it out and add a pinch more salt so it's not overly "super chocolate caramel sweet" flavored. I love the way you arranged the pecans! Thank you so much! If I do this again for Christmas I was thinking of doing a snowflake pattern or Christmas tree. That baby looks SENSATIONAL! A showwwwww stopper for sure! This is the second recipe I've seen that calls for bourbon in a pecan pie. Is this combination typical? That is a gorgeous pie! And bourbon-pecan is always a winning combination!